Many of us probably grew up witnessing classmates being sent to detention, and some of us might even have feared being sent ourselves. Although our fear of detention was mostly due to the fear of getting in trouble with our parents, we were also aware that detention was a few steps away from being expelled from school. For some students today, school discipline creates another level of fear. Under a zero-tolerance policy, any disruption in class can lead to an automatic expulsion. While zero tolerance measures were inspired by school shootings in primarily white suburban schools, they have mostly been adopted and enforced in urban schools, disproportionately impacting the poor, and students of color. Student’s in low-income areas with zero tolerance measures have a greater chance of being suspended and expelled. African-American students only represent 16% of the students in the U.S Department of Education, but account for 40% of students expelled, making them three times more likely to be suspended than white students. American Indian students represent less than 1% of the student population but account for 3% of expulsions. Zero-tolerance policies do not distinguish between serious and non-serious offenses; students have been expelled for tardiness or simply carrying nail clippers. These policies don’t differentiate between students having behavioral disorders versus students intentionally causing trouble. Students as young as preschool have been approached with force and handcuff for minor disciplinary issues such as throwing a temper tantrum. How do suspension, expulsion, and arrest help change the child’s behavior? ensure school safety, but there is no evidence that zero-tolerance policies actually improve school safety. There is, however, evidence that zero-tolerance policies account for high percentage of juvenile arrests for 70% of African American and Latino students. Schools should be a safe haven for students, not a place where they are subjected to arrest. Students need a supportive school climate that promotes learning, not punishment. There needs to be a decrease in suspensions, and discipline needs to refocus on the social emotional and behavioral needs of the students. If you are concerned about the prevalence and impact that suspensions have on students, let your local school district committees, and policy leaders know that you want to see a decrease in suspension referrals. Suspension and expulsion are not the best forms of discipline as it does not support youth development, they do not give students the opportunity to improve the behavioral issue. Removing students from school is excluding them from the opportunity to engage in prosocial behaviors and lowering their chances of graduating. For an effective student behavioral change, schools need to develop disciplinary approaches that are evidence-based. This video shows how schools are replacing suspensions with holistic approaches. Our children’s education depends on our dedication to implementing alternative disciplinary measures. 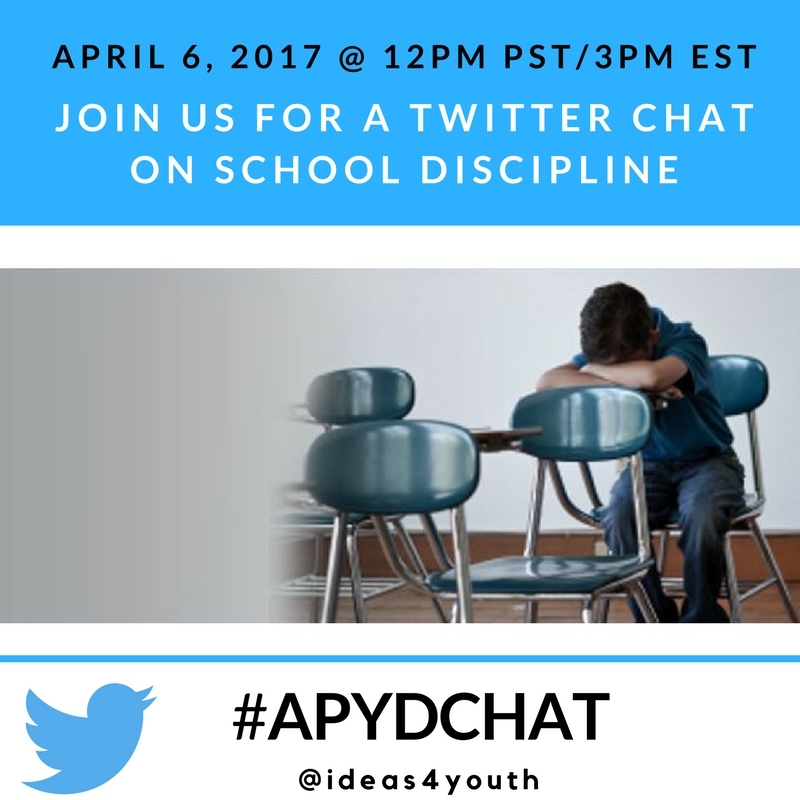 In order to bring awareness to the impact of zero tolerance policies as well as share best practices on alternative disciplinary measures, we invite you to join us for a tweetchat on April 6, 2017 at 12pm PST/3pm EST. Make sure to follow The Alliance for Positive Youth Development on Twitter @ideas4youth and use the hashtag #APYDCHAT. We look forward to coming together on this important issue and working towards positive and sustainable change in policy and perspective. Ileana Naranjo is a macro Social Worker with a career focus in youth development. She received her Master in Social Work from the University of Southern California with a concentration in Community Organization, Planning and Administration. While working towards her Masters in Social Work, she performed a program evaluation for Year Up's Peer Support Program, as well as a school violence threat assessment and intervention in Eureka City Schools. During her MSW internship at SISGI, Ileana focused on providing research for SISGI’s Alliance for Positive Youth Development network. She became interested in youth development while working as a teacher assistant for the Los Angeles Unified School District. Following her teaching assistant job, she became an AmeriCorps Mentor, where she mentored at-risk youth in the Baldwin Hills district of Los Angeles, California. While working to complete her B.A. in Religious Studies, she continued to mentor youth in LAUSD’s Juvenile Delinquency Program; a program aimed to help get students that have been incarcerated back on track with graduating High School and preparing them for college and careers. Ileana’s passion and focus are to ensure that schools and communities have youth programs that enhance the strengths of youth, and that help develop social, emotional, and cognitive competencies.